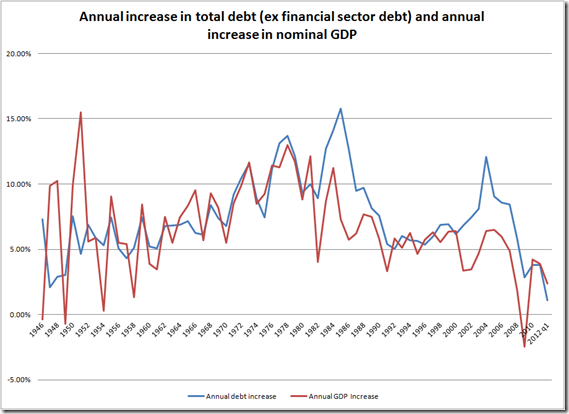 Debt and the risks of debt to expected returns..
Real GDP growth since 2000 according to BEA data is some 1.57% per annum (2000 to 2011), which covered a time when debt accumulation exceeded nominal GDP growth. 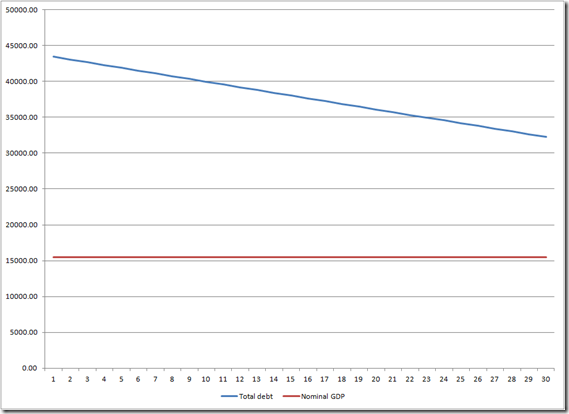 Real annual GDP growth could be significantly lower going forward for a number of reasons. 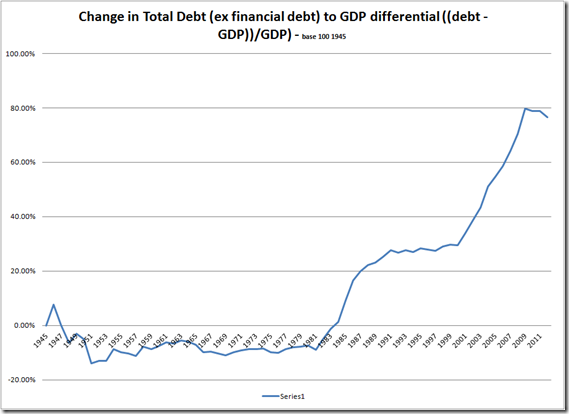 So at what point could we expect deleveraging to have completely worked itself out of the system? This is a difficult question, but I think the mid 1990s (1995 to 1997) represented a plateau beyond which debt should not have been allowed to accumulate further. 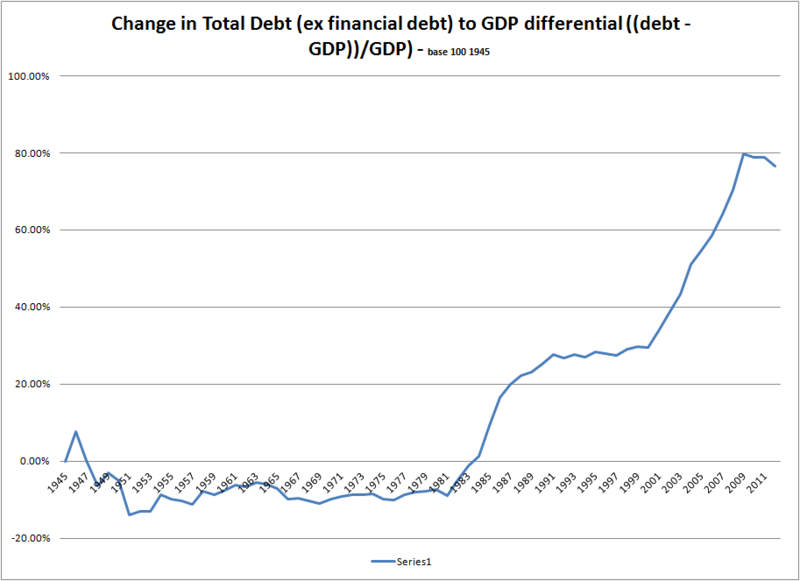 I tend to feel that this level of debt may have better allowed for the workings of a modern financial system and would have accommodated a wider interest rate range (the only range current debt levels in many countries can tolerate is close to zero interest rates. 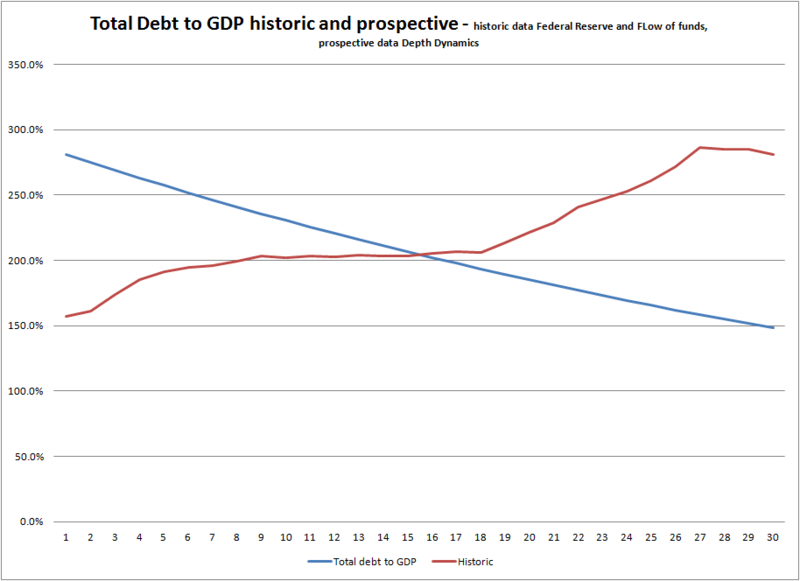 So, if we assume that 1996, when US debt (ex financial sector debt) was some 203% of US GDP, is an equilibrium figure around which the economy can start to grow in a balanced fashion once again, we can look at a scenario which assesses the timeframe for this to happen. 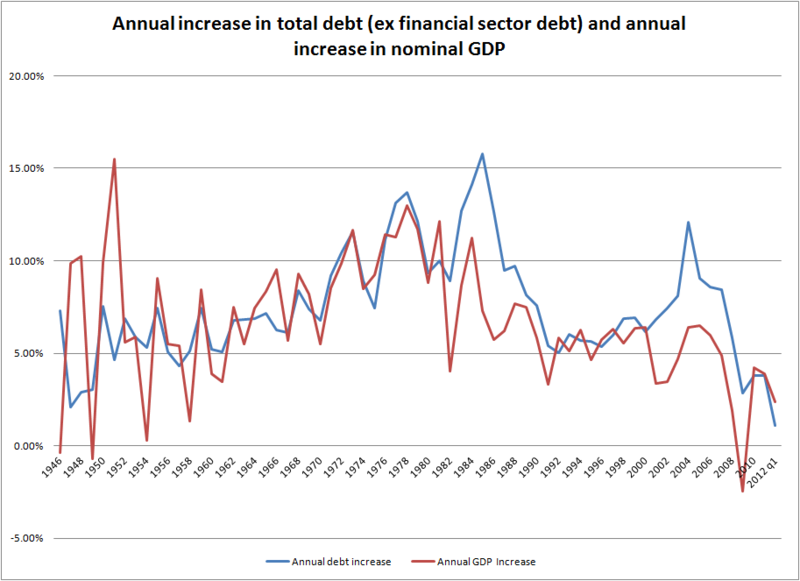 Well, the above chart shows the current total debt ex financial sector debt relative to current GDP (year 0), with nominal GDP projected forward by 2.5% per annum. 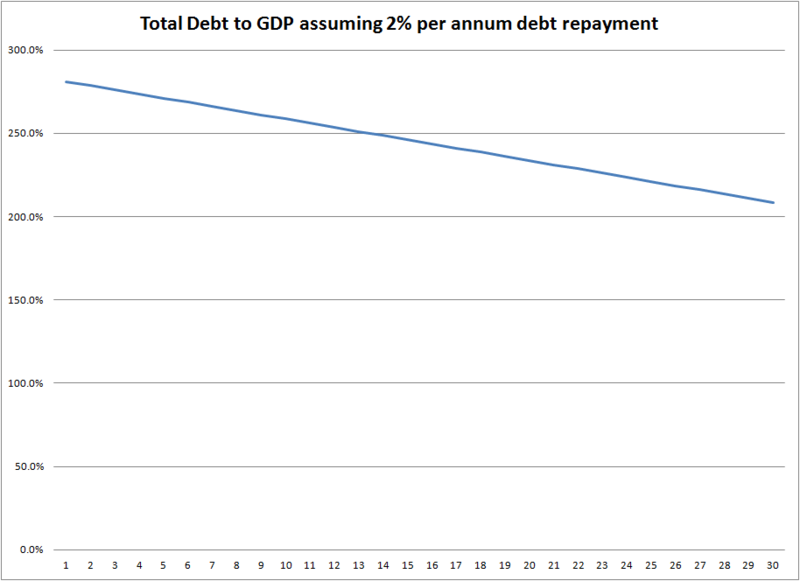 It could take close to 16 years to break free of debt. 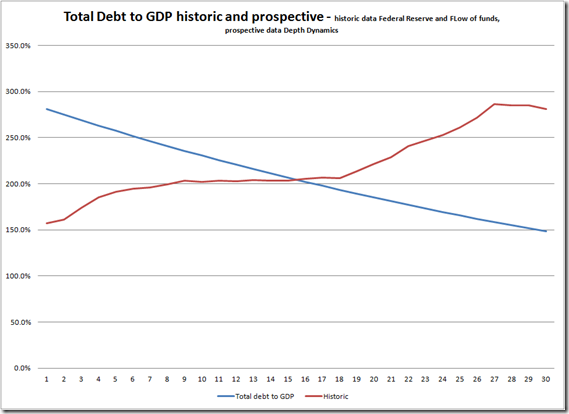 The 1% real growth figure allows for lower starting real GDP growth as the weight of debt impacts most, and higher real GDP growth as we move closer to balance. Therefore in the early years, real earnings’ growth is going to be under pressure, just from deleveraging alone: deleveraging will also impact other factors which drivers earnings, so corporate earnings growth could well lag even low nominal GDP growth rates. 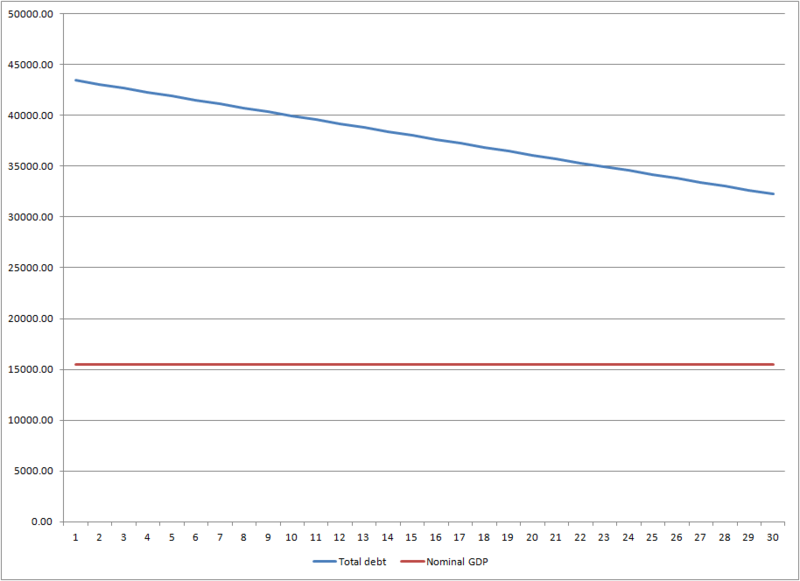 It takes almost 30 years for the ratio to drop, at the expense of GDP which does not increase in nominal terms, but depreciates in real terms. 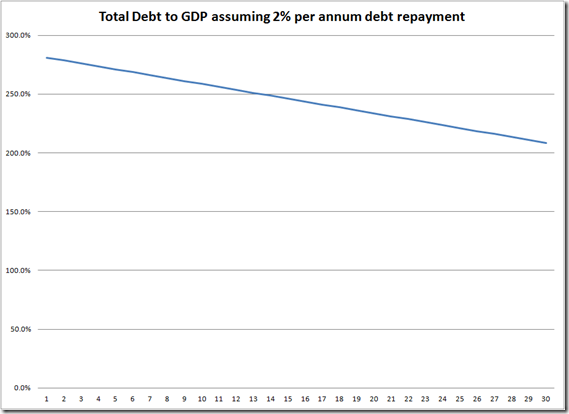 Debt repayment is assumed to directly detract from expenditure and hence from GDP, and therefore debt repayment under low nominal growth scenarios is impractical. 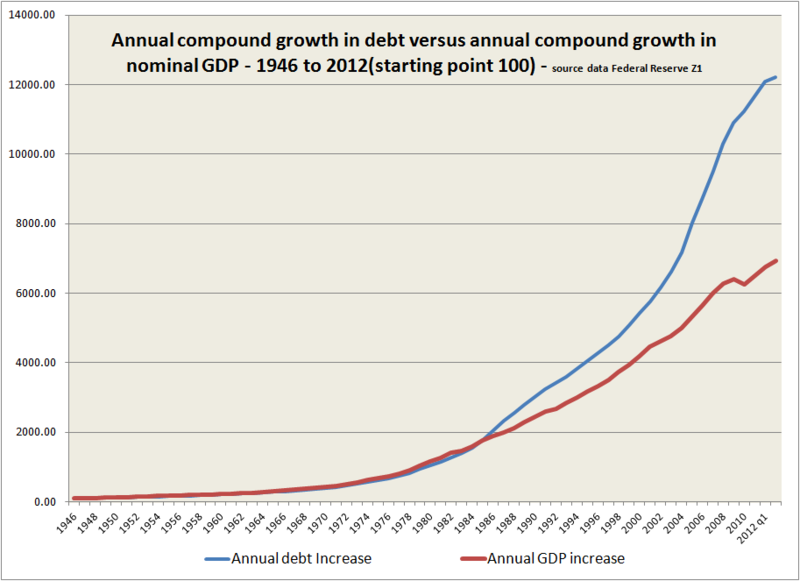 Obviously, each set of figures dictates a different outcome: the problem at hand though is that very high debt levels impact low nominal GDP growth environments and hence nominal earnings growth well into the future, and the job of policymakers as we now know, is a next to impossible one. We could easily be in for miserable earnings growth, or if we attempt to pay off total debt, little by little, consign ourselves to declining real earnings growth and declining market values of equity. Therefore, even humdrum boring return expectations may in fact be reliant on out of the ordinary catalysts. We need a) some technological revolution that lowers the costs of production and enhances both corporate earnings and spending power, b) a startling increase in emerging market demand and spending power, and c) a large adjustment to retirement dates or some other demographic influence. Analysis that does not delve deep enough into productivity game changers, or near term sources of final demand are not going to cut it when it comes to understanding the drivers and realities of earnings growth and hence total return on real risk assets under the current risk scenario. 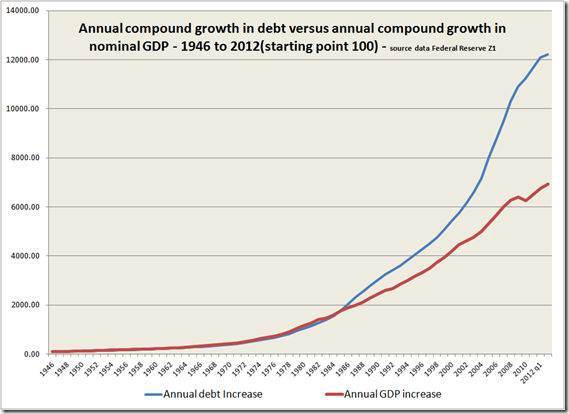 This entry was posted in Capitalism in Crisis, Deflation and deleveraging, Economics, Return assumptions by Depthdynamics. Bookmark the permalink.